To answer this, we’ll need to delve deeper into the very definition of natural backlinks. Link diversity is one of the key features of a Google-friendly backlink portfolio. 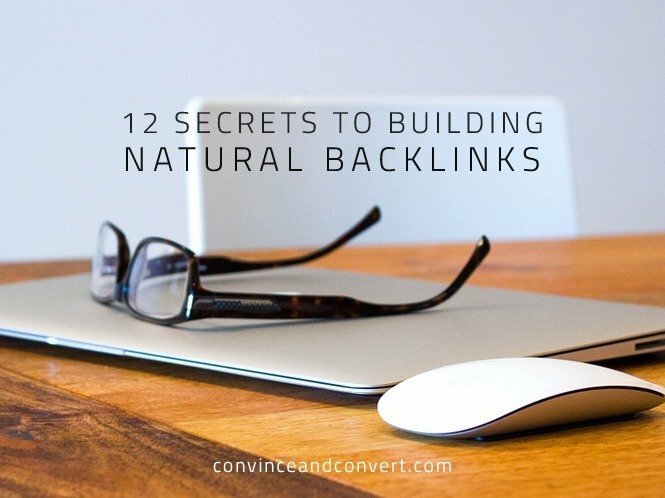 Yet, the very definition of a “natural” backlink still seems vague for many. Given that the closest Matt Cutts has ever got to defining natural links is saying they “are better than non-natural,” you can’t really blame SEO experts for interpreting the term differently. A logical assumption is that if you are able to create content that is attractive and relevant enough to inspire people to link to it, you’re done with the natural link creation. However, even the best piece of content can remain forever hidden from the targeted eyes if it’s not strategically distributed. Now, whether such an approach should be adopted in relation to natural links is a matter of dispute in the SEO circles. To figure this out, the team at topdraw interviewed six important SEO figures and came up with some interesting answers. Are in a natural context: The content surrounding the link is relevant to that on the target page. Provide value for the readers: They actually offer additional information about a certain topic. Have an anchor text: The text is integrated with the page contents in a meaningful way. Of course, these are just some of the features by which you can determine the relevancy of a backlink for your website. Based on the goals you set for your own business, you should be able to easily determine whether a link is worth pursuing and whether its final creation is actually natural. Supposing that you support the view suggesting that even a pursued link could be seen as a natural one, you should consider deploying the following tactics. (Even if you don’t, we encourage you to scroll down and consider whether any of these may work for your website). In the topdraw post mentioned above, Eric Ward gave an excellent example of a natural link building strategy that included some form of outreach. Namely, after creating a relevant post, Ward reached out to an industry professional whose interest in the topic was easy to discover. What followed was a backlink, as well as some form of word-of-mouth marketing for the content itself. Paid links have always been a gray area in the world of SEO, and Google has advanced algorithms that keep track of this, which is why this option is generally not recommended. However, the point of the statement remains: whenever a backlink has an actual value, it can be considered natural. Therefore, reaching out to people who might be interested in sharing the content should not be separated from the notion of natural links. On the contrary, this can be a more effective strategy than simply creating content and waiting for the audience to notice and link to it. Before you set out creating content, you may first want to check if anyone might be interested in republishing or linking back to it. Recycling the same old topics can be useful for maintaining the consistency of publishing, but the creation of natural backlinks requires you to offer something new, something juicy. Therefore, you may first want to make a list of websites that gather your target audience and consider the types of content they might find interesting. For example, if you want to be featured on a website that publishes industry news and research, consider developing a newsworthy research on the burning topic. This is, of course, easier said than done, but approaching content creation this way can get you much farther than sticking to the same content forms all the time. A single white paper or ebook can bring you more natural backlinks than any of the generic 500–1000 words post that can entertain your audience only for a limited period of time. This technique also requires you to first identify the target and develop content based on the opportunity discovered. Building upon someone else’s content is particularly useful for controversial topics. If the story is relevant enough, other people will consider taking your point of view when they decide to relate to the story. Step 1: Find link-worthy content. Step 2: Make something even better. Step 3: Reach out to the right people. Clearly, the third step is critical here. However, it is also most frequently overlooked by creators of awesome content, who tend to believe that great content is all you need to have people linking back to you. If this was true, the skyscraper technique wouldn’t be a technique at all, but rather a lucky shot. Once you discover (and make a list of!) influential people or companies in your industry, you can collaborate with them on creating amazing content. Many companies in your industry have a dedicated press section in which they feature news somebody else has written about them. Watch their pages for important updates, and then cover the story on your blog. Of course, you still need to make sure they won’t miss it, so it pays off to consider reaching out to them to inform them. Chances are both of you will be happy, so go ahead! Interviews are an excellent, general-knowledge type of content that can be interesting for both you and your interlocutor. Doing an interview may require you to do extensive research and contact multiple people, but the eventual results should translate into a highly linkable and relevant unique post. Bonus tip: If you include more people in a single topic interview, you increase your chances of being shared by them. This form of content is popularly known as “ego bait” and relies on providing benefits for all the parties involved. You reach out to influencers for expert opinion to get material for awesome content, while they get an opportunity to increase their own visibility. Creating such a piece of content typically requires extensive research and can take a while, but the results typically translate into several natural backlinks from the interviewees’ blogs. If you wish to learn more about doing this, here’s an ego bait on ego bait! Of all the techniques covered above, one thing is essential: finding the right topic. If you want to deliver something extraordinary, try finding the burning issue first. Websites such as Reddit and Quora can direct you to a number of unanswered questions. The great thing about doing research on Quora, for example, is that you can find quite a few influencers along the way! Here, you can even learn more about their area of expertise to find the right question to ask them. If you do your research right and let them know about it, you increase your chances of having your content linked to from other pages. Natural backlinks often come in a number of different forms and from websites that operate in different ways. This is why you want to provide several link options by creating as many content forms as possible. From classic how-to posts to infographics and ebooks, you should consider producing everything you can and promote accordingly. In order to determine the content forms you should work on, examine this chart, regardless of the actual industry you operate in. 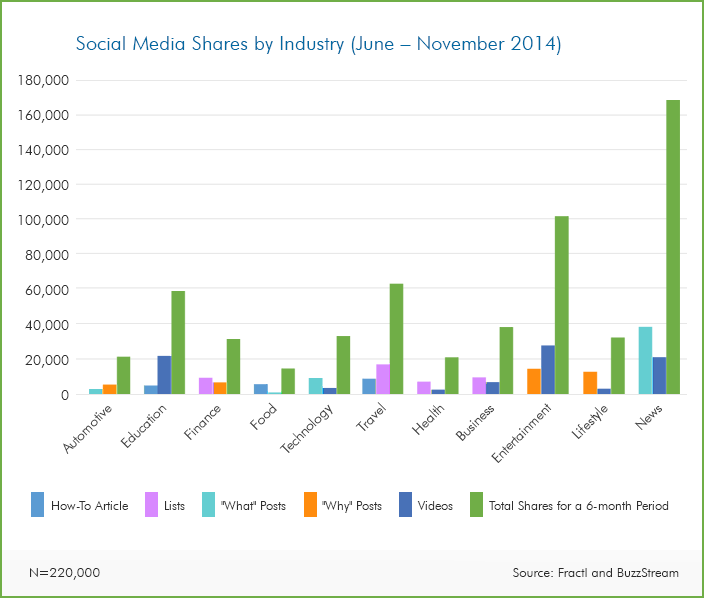 This chart includes six distinct types of posts that work great for most industries. How many of these are you creating for your website? Every content creator’s dream is to achieve virality across multiple channels, but the truth is that different forms of content are treated differently on each online channel. This is why you should never simply assume what may go viral, but rather explore the topics and ways to actually achieve this. Visual content is often regarded as the most effective content form a marketer can create. 52% of marketing professionals say that video is the type of content that brings the highest ROI, while the SEO world recognizes its value for improving search rankings. Given that everybody seems to love them, videos should constitute an important part of your natural link building strategy. Additionally, posting visuals such as infographics on infographic submission sites can immediately bring streams of interested visitors to your site, some of which may even decide to republish your great visual. Identifying the right channels is essential for encouraging organic content promotion. For example, posting a research paper on Academia.edu can generate you 75% more citations in the course of five years, according to the website. Sometimes the best way to tell certain people about your content is to reach out to them via email, but this never guarantees your email will be opened, let alone answered. This is why you should consider utilizing other communication channels, of which social media is often the most efficient. Set aside time to explore the relevant hashtags and Twitter chats that gather your industry leaders. Some of these chats announce their future topics in advance, which can be yet another great opportunity for you to create purposeful content and have a promotion channel ready at your disposal. Most people offer a single piece of advice when it comes to content creation, and you’ve probably heard it multiple times: Create content for people, and not for search engines. However, these two are not necessarily mutually exclusive, meaning that you should take into account several different factors before starting content creation. Organic search is one such factor. By giving your post a search-friendly title, you’ll enable more people to find it on Google. If it answers a question that has a large number of monthly searches, that’s already a great opportunity. News sites are another factor. As mentioned above, in order to get to the news website, you should definitely first ensure you have a story worth reading. However, this doesn’t mean that you should make a scandal in order to get to the front pages; oftentimes, simply announcing your future strategy or business results with proper commentary is a good way to catch the attention of the relevant media. If you’re planning to do industry research, for example, find websites that might be interested in sharing this type of content. This will help you understand the topics they typically deal with and if there’s anything that has been left unsaid. Encouraging social sharing can help you get noticed and eventually linked to. This doesn’t simply mean you should share and tweet; ask others directly to recommend your posts publicly. However, make sure you’re consistently reaching to the people that actually might be interested in what you offer, rather than spamming everyone on social networks. Finally, it’s worth noting that most of these techniques work only if you’re persistent. Sometimes, your initial target may fail to link back to you, but this shouldn’t discourage you from doing another similar research next time. After all, you get to keep the awesome piece of content on your website, so this can never be a waste of time. Connecting all the dots (including finding the right target, the right topic, the right form, and the right channels) may be difficult to get right the first time but will bring benefits in the long term. With a strategic perspective on content creation presented above, natural link generation no longer seems like an oxymoron, does it?